How's the traffic? Ask Google. Oh, Google, how I do love thee! Let me count the ways: you've finally, at long last, added traffic overlays to Google Maps. Just hit the "Traffic" button up next to "Map" to get the 411 (people still say that, right?). The information has been available from Google via your cellphone in the past, but now they've added it via the web interface as well. The legend is typical Google complexity : red means slow traffic, yellow means so-so, and green means clear. Gray means that the road has been filled with concrete . Or no information. One of those. 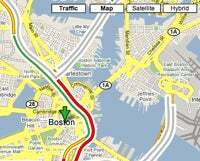 As we speak, traffic on the expressway in Boston is pretty much stop-and-go; while I90 looks pretty clear. I'll be sure to avoid the expressway on my commute up the stairs .